Highlands NC will have dahlias on display this week. The annual Dahlia Festival takes place September 14 through 16, Thursday through Saturday. The special events that are lined up showcase a flower that is blooming throughout the Highlands NC area at the moment. The dahlia comes in a variety of colors and sizes and is celebrated in our mountain community each September. This year the Dahlia Festival kicks off with a special dedication. The Prince House is being added to the National Historic Register and a plaque honoring this designation will be unveiled on Thursday, September 14 at 5:30 pm. Following the plaque ceremony will be the Dahlia Festival Patrons Party at 6:30 pm. “Denim & Dulcimers” is a ticketed event and one not to be missed! 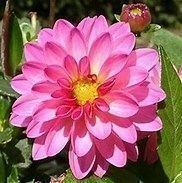 On Saturday, September 16, is a Highlands NC community favorite, the Dazzling Dahlia Flower Show. This is an amateur flower competition open to all ages. The dahlias will be on display from 1 to 4:30 pm at the Highlands Recreation Center. The price of admission is $5. If you will be in town this weekend do not miss the flower show! Contact our team at Berkshire Hathaway HomeServices Meadows Mountain Realty today to learn more about Highlands NC real estate. We welcome the opportunity to update you on current market conditions while helping you get to know the area like a local. Let our knowledge and expertise serve as your guide to Highlands NC.